You have our full details and our phone number in the confirmation e-mail you receive at your booking. Please contact us and we will send your driver, although in the vast majority of cases, we will contact you. Each passenger can carry a bag of 20kg (maximum total size 158cm) and hand baggage weighing 5kg (maximum dimensions 45cm x 35cm x 20cm). Extra luggage must be declared when booking. The vehicle to be used for your transportation will be suitable for the number of people traveling and their luggage. How can I specify the hotel that I’m going to? There is a specific field in the order process that you can fill your Hotel name. 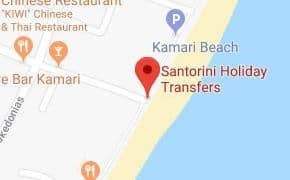 For any issue, we recommend that you book by phone at +30 2286033665, where you can determine with us the exact address of the hotel you wish to transfer. All infants (0-2yrs) and children (3-11yrs) should be included in the booking (declaring them as Passengers) to ensure the right vehicle with sufficient space. The relevant laws on the use of child seats for infants and children vary from country to country and Santorini Holiday Transfers complies with Greek law. If you book a transfer, we recommend choosing child seats for people under the age of 12 or up to 135 cm for safety reasons. We are able to guarantee prepaid child seats in most destinations within Santorini and this option is available during the booking process. Unfortunately, booking must be done at least 24 hours in advance. We need a time to organize your transport in relation to the vehicle and the driver. What happens if my flight or ship is delayed? If your flight is delayed, we will reschedule the Transfer Service and we will pick you up at the new arrival time, subject to availability. If there is no availability at the new arrival time, your money will be refunded in full. If for any other reason you are unable to be at the pickup point within a reasonable time after the scheduled start time of the transfer you stated at your reservation, we will try to contact you at the telephone number you provided. If we are unable to locate you because you have not provided a mobile phone number during the booking process, you have no connection, there is no signal, you have not activated the voicemail or the call is unanswered, the service will not be provided and unfortunately in such case we can not return the money.